Do you know the signs that your horse is healthy? You know your horse is sick when he won’t eat his feed, and you know he needs the vet when he has a huge cut that’s bleeding. But do you know what to look for to tell if he is healthy every day? Here are some things to check every time you visit your horse to be sure he is healthy and happy. One of the first things you look at is a horse’s face, right? When you look into his eyes, are they bright and clear or are they cloudy with a milky color to them? Clear, bright eyes are a sign of good health. If there is any discoloration to the eye, call your vet to be sure that your horse doesn’t get an eye infection. There shouldn’t be any discharge from his eye. If there is, it means that there’s something in his eye that is irritating him and making it tear. If the discharge is yellow or greenish in color, he may have an eye infection. The ears are a great indicator of how a horse is feeling. They should not be crusty and filled with grit; they should be clean and free from sores. Protect your horse’s ears so flies and other insects don’t bite them. 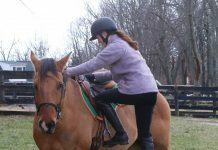 Itchy ears can make your horse shake his head when you try to put his bridle or halter on him. There should not be any kind of discharge from a healthy horse’s nose. Don’t be worried if there’s a bit of clear secretion, but if it’s yellow or greenish, your horse is probably sick and you need to call the vet. Nostrils should be clean and not filled with dirt—this can make your horse sneeze and cough. If your horse has a light-colored muzzle, be sure to put sunscreen on it so it doesn’t get sunburned and become painful. When a horse is resting, you should not be able to hear him breathe. If you can hear the air go in and out, something may be wrong. He may have heaves (like human asthma) and need to be kept away from dirt and dust. Your horse should not cough or blow air through his nose repeatedly; this could mean that he has a cold that needs to be taken care of immediately. Call your vet if your horse is having trouble breathing, she may put him on some antibiotics and you may have to keep him away from other horses. Is your horse fat? If so, he’s probably getting too much food. Check with your vet or a feed specialist to be sure that your horse is getting the right amount of food for his exercise level and body type. If your horse is skin and bones, ask the pros what type of feed or supplements you should be feeding to bulk him up. Your horse’s weight is one of the best indicators of how healthy he is. An overweight horse can be just as unhealthy as a skinny one. Do you have to work just as hard as your horse to get him around the ring? Or, is your horse bouncing off the walls of his stall waiting to be let out? Both of these behaviors are indicators of his energy level. You don’t want a horse that is so tired that he can’t move, but at the same time you don’t want a horse that is so hyper you have to lunge him for an hour before you ride. Your horse gets energy from his food, so be sure to ask an equine nutritionist (some feed stores have them) about the amount and type of feed your horse is getting to make sure it’s the right amount for him. Are your horse’s hooves dry, long and cracked? Or are they solid, trimmed and hard? An old saying goes “no hoof, no horse.” How true it is! If your horse’s hooves are not taken care of, you won’t be able to ride him at all, and that’s no fun! Make sure your horse gets his hooves trimmed every six to eight weeks and that he doesn’t have any other problems, for example thrush. In the summer, oil his feet if you’re riding in a dry, dusty arena. Feel your horse’s legs every day to make sure there’s no heat or swelling in them. If they are warm to the touch, this is a good indicator that something is wrong and he might be sore. Your horse’s legs should be cool and tight. If they are warm, jog your horse in-hand to see if you can tell where he is lame. If he is, call your vet or a knowledgeable adult to find out what is wrong. Make sure you feel all the way down the leg to the hoof. If his hooves are warm, he could have an abscess or be foundering. Your horse’s coat should be shiny and it should shed out when the weather warms up. If his coat is dull, rough or not shedding out, he is not as healthy as he should be. You may need to add a little more elbow grease to your grooming routine or you may need to check his feed to make sure he is getting enough vitamins and minerals. If he doesn’t shed out or if he grows a long coat even in the summer, he could have Cushings, a disease like human diabetes. Ask your vet if she thinks there is a problem. Run your hands all over his body to make sure he doesn’t have any lumps, bumps or bruises that are causing him pain. If you find a cut or scrape, clean it right away with fresh water and call the vet if it’s very deep or looks infected. * This article first appeared in the July/August 2005 issue of Young Rider.